Synergy Studio is the latest iPad music application from 4PocketsAudio, the creators of Meteor Multi-Track recorder and StompBox guitar effects rack, which featured in Apple’s iPad 2 TV commercial in January 2012. 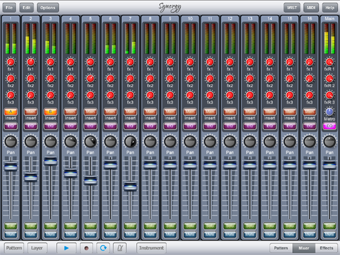 Synergy Studio is a sequencer that enables music creation by all musical abilities. By simply tapping on the grid interface users can lay down a series of notes and patterns of up to 64 notes. There are four main instrument categories to choose from on the application: Drums, Analogue Synthesizer, Sample and Pad Synth. Each category contains different types of instruments – for example in the drum kit category you can choose from an array of different kits including Analogue T9 (TR-909 emulation), Orchestra, Rock and Techno. Further instrument packs are available in Synergy’s free sound library or as In-App purchases. Musicians can share projects with other iOS devices using Bluetooth technology. Simply select the WIST function located at the top of the screen to seamlessly connect with other iPads to share tracks and projects with one another. When you’ve finished your pattern you can export it to external apps such as Meteor, or you can add it to the song chain in Synergy. The song chain enables you to link together your patterns to create a complete track. Exporting your final work from Synergy is just as easy with built in functionality including Dropbox, SoundCloud, Email and Pasteboard into other applications. Whether you want to create classical or techno tracks, Synergy Studio provides you with the perfect platform for your musical creation. Synergy is released on 3rd December and is available from the Apple App Store. • Synergy Studio is a sequencer that enables music creation by all musical abilities. • Export and share to other iOS devices via Bluetooth, Pasteboard, SoundCloud, DropBox, Email and FTP.